The Global Institute for Motor Sport Safety is already the independent group doing these investigations. Why would we need another independent group to investigate the independent group we already have??? "The Global Institute for Motor Sport Safety is an international organisation based in Switzerland that undertakes research to improve motor sport safety worldwide. It is wholly-owned by the Fédération Internationale de l’Automobile"
Edited by KnucklesAgain, 09 December 2018 - 13:21. As Formula E arrives in the wonderful and progressive kingdom of Saudi Arabia for the start of its new season in a few days time, another series takes the Halo to the race track. Probably get a lot of flack for this - I think it looks quite in keeping with the whole design of the car. Well it is the first car to be fully designed around the device. Even this year’s F1 cars were built on years and years of legacy regulations to which the halo was adapted. If I'm right that might not be strictly accurate, I seem to remember there was a delay in the car's debut and delivery because of modifications made to incorporate the Halo. That's not to say that they weren't also designing the car to work looks wise with a halo and were just waiting on FIA conformation as to wether to include it or not, because I do not know the answer to that. I am confident that the looks will improve as the Halo becomes more integrated though. I actually think one of the benefits the FE version has is no aero fairings (though they are attaching that LED strip) which make the F1 versions look somewhat bulky in my opinion. Edited by Ben1445, 09 December 2018 - 16:31. What concerns me most is not the "Halo saved Leclerc" headlines being pushed around (it quite clearly helped) but more the dismissal of any issue with Hulkenburg's Abu Dhabi crash. The FIA (and Hulk)were exceptionally lucky that fire didn't take hold, and they are being totally disingenuous with their conclusions that are drawn without an investigation into the crash. Maybe ExFlagMan can help with this, but I believe the standard process is to right the car to get the driver out, and has been for many years. That's what I've seen in other categories of racing, e.g. Formula Ford. Depending on the angle of the car, it's not usually possible to crawl out, and there's a risk to the neck associated with releasing the belts too. That was definitely the process being followed in Hulkenberg's accident. As for fire, I also think it's standard practice to put it out first and rescue the driver afterwards. Yes, drivers went into the flames to rescue Lauda, but marshals were few and far between, and woefully ill equipped, at the Nurburgring in 1976. (I was there but mercifully not at the scene of the accident). Roger Williamson died because the heroic David Purley couldn't right the car; Jo Siffert because although the car was the right way up a brave marshal couldn't get him out and in both cases the equipment wasn't up to the fierceness of the fire. In the late eighties I witnessed an ERA driver flung from his car. He lay badly injured beside it as it burst into flames. Did the marshalls drag him away? No, fortunately not. They tackled the fire, and put it out so he could be attended properly. (For info, he lost an arm). I liked your comment: "Anyone with half a gram of brains can see that it (the halo) would help protect in certain circumstances." We seem to have a few on here who can't see. Edited by Sterzo, 09 December 2018 - 17:00. It is the recommended method as it is much easier - and potentially safer for the driver and the marshals - provided you have enough people around to do it properly. I recall one driver who ended upside down near our post - the first marshal on the scene asked him if he was ok - the reply was 'well I was until I released the belts....'. It is much safer to try and put the fire out first. Not only for the obvious reason that it makes it safer for driver and marshals, but also for the fact that the longer a fire burns the harder it is to put out - the longer fire burns the hotter metal parts get and hence the chances of re-ignition are increased, plus the potential for fuel/oil and other flammable fluid lines being burnt through and feeding the fire. Edited by KnucklesAgain, 09 December 2018 - 19:32. 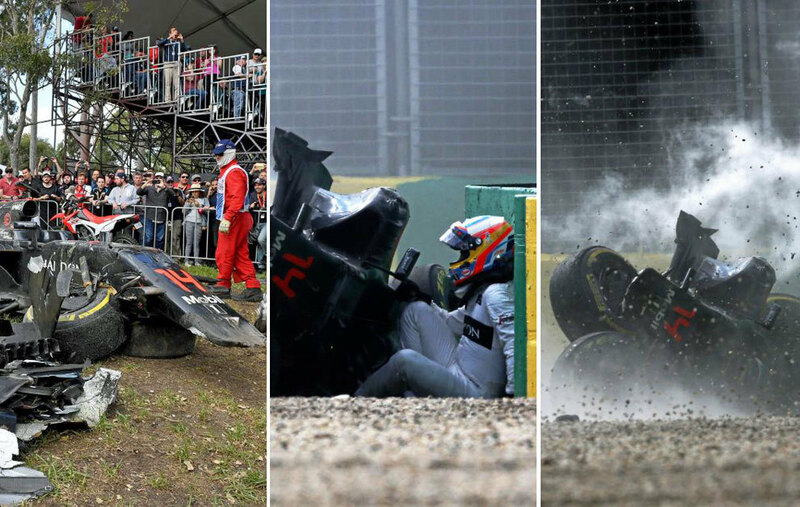 Alonso-esque crash such as the one he had Australia. Perhaps a fire breaks out due to ruptured oil tank/lines and spreads rapidly. Without halo driver can escape. With halo driver is trapped. This is a very unlikely scenario. It's probably more likely that the halo will benefit by deflecting debris. So will the FIA now take measures to try to eliminate this risk? How will they do it? You could also have a scenario where it's the other way around: with the halo the driver can escape; without it he would have been trapped. It really depends on how the car ends up, doesn't it? You can't eliminate the risk. You could get trapped even without the halo. Most recently it has happened with tyre barriers. Maybe the roll hoop could be higher. Alonso didn't end up upside down in that crash btw. Are you going to finish the paragraph you're quoting then? Or are you just going to conveniently half quote what it says? The Global Institute for Motor Sport Safety is an international organisation based in Switzerland that undertakes research to improve motor sport safety worldwide. It is wholly-owned by the Fédération Internationale de l’Automobile, motor sport’s governing body, but is a separate legal entity, enabling it to have the freedom to undertake all types of safety research work across motor sport, from professional categories to grassroots racing. Edited by johnmhinds, 09 December 2018 - 23:05. You missed my main point. There is always goint to be an element of risk in motorsport. At some point you have to stop chasing the smaller risks or it will destroy the sport. No risks can be completely eliminated. It's like a dog chasing it's own tail. Microimprovements that achieve very little while damaging the attractiveness of the sport to new audiences. It's here, it's safer, it's an improvement. But one of the reasons I started watching was because I could spot the driver's helmet & identity immediately. With every 'improvement' to the sport there are less viewers. I'm not sure if you are kidding here or not...you started watching F1 you could identify the driver? What about because it's an engineering miracle and masterpiece? Because watching an F1 go through Becketts or Eau Rouge makes the hairs on the back of your neck stand up? Because the sound of the engine firing up makes you excited? Nah, it's because you can see the driver. Sure. The arguments against the halo are getting more and more desperate. However, I agree with the point about constantly finding new improvements, simply because they are an improvement. There should always be a compelling reason to change something, and I think we got that with the halo (although I would have preferred different options but hey ho), but each new improvement should be looked at holistically in terms of does it 'damage' the sport more than it gains in other improvements. I'm not just talking safety here, I'm talking any change to the current F1 structure, procedures and cars. I think the halo comes on the right side of that debate, that there was compelling evidence that it would save lives in the long run and that the aesthetics damage was minimal, to 'most' fans but it may not be the same for the next 'idea'. Edited by sgtkate, 10 December 2018 - 08:59. Edited by Fatgadget, 10 December 2018 - 09:09. Oil fires are not much of a problem (witness Hulkenberg last month). Oil is rather difficult to set fire to and carried in small quantities compared to the 100+ litres of fuel. As previously explained, the fuel and self-sealing fuel lines are so well protected that a car actually going up in flames is something we don't see in f1 any more. I recall one significant fire in the last 20 years or so....and we can deal with fire. The drivers wear suits which keep them safe for, I believe, 45 seconds to a minute? Marshals with proper training and equipment should be on the scene in seconds and able to put the fire out before any serious harm comes to the driver from flames or heat. It's almost 29 years since an F1 driver last received even second degree burns in a crash. Even without the halo, drivers have difficulty extracting themselves from upturned cars unless they're on tarmac. If the car is in a gravel trap or rests against a barrier, it's often safer and easier to get a bunch of marshals to put the car back on it's wheels/belly. That's what the standard procedure is. That's what marshals are trained to do. Because even before the halo it was determined that was the safest course of action. Hulkenberg may have been worried about the fire and getting out. But in fact he was in no danger at any time. Leclerc was in genuine danger from Alonso's car crashing over his. They are independent enough to do the research, it would only be a conflict of interest if they were financially linked to the motorsports they are researching for. There is no direct link between the FIA Institute and FOM or TOCA for example. And I never said that extra verification wasn’t a good thing. When I asked who else could do any of this extra research people replied with NASA and universities, neither of which are going to be as good as the FIA institute already is at the job or have the funding needed to do it. Also, why should we *need* external verification? It's a sport, not law. If the FIA one day that drivers can only wear fluorescent pink to make them more visible for safety, or they decide to close the wheels then they can pretty much just do it. They are the law within F1 and they can do pretty much anything they like. Now I'm picturing Jean Todt as Judge Dredd. And therefore they have to take into account a lot more than just the specific aesthetics and the safety angle. Even if NASA (LOL) came out with a 'better' solution that was as safe but preferred by the fans, why do you think FIA would go for it when they have many other things to take into account? The FIAs (alongside FOM from a different angle) job is to keep F1 and it's junior formulae going and to have laws that achieve that. They have obviously made a calculated decision that the Halo is the best way to do that, and quite frankly I would suggest it is extremely arrogant of us to pretend to know better. We can of course question the decision and voice our dislike of it, but when people start making out it's some kind of a conspiracy or that we should get NASA to evaluate I think they've lost the plot. Edited by sgtkate, 10 December 2018 - 13:01. The introduction of the Halo was inspired by the threat of litigation (not of Bianchi's accident, but the general risk faced by motorsport), that is not a secret, Jean Todt admitted it in September this year, quotes published on this website. All it really remains to be seen is if "doing something" is enough or insufficient, which may or may not be legally tested in a tragic circumstance in the future. Obviously external expert verification which could not be accused of being "motivated" would be better if it got to a certain point. I think the biggest risk for the FIA here is if the Halo inadvertently causes a fatality that otherwise would not have occurred but I think the chances of that are remote. That fits with my theory that the FIA have based all their decisions on probability (which is fine). All in all I think the FIA are sitting pretty. I beleive FIA have ticked all the boxes of looking "proactive" and"responsible" whilst being able to dine out on the PR message of being "technological and safety pioneers" Look at us! It may never need to be legally known if the Halo is full of integrity or a total placebo. In the end I still think the greatest risk that motorsport is exposed to is a car flying into the crowd, all these other moves such as Halos and fuel flow limits are loose change compared to that horror - it terms of the legal battle that would ensue. This is a very similar point to my post, that the FIA has bigger considerations than just the safety of drivers in one specific area (flying debris) and aesthetics. I am giving them credit for being pragmatic which may not be the case, but I believe the FIA are basically being forced into any solution otherwise they are leaving themselves open to being sued and perhaps even F1 ending as the sport we recognise today. I can see a future in which the FIA is forced into a closed cockpit and closed wheel formula unless they are prepared to show pragmatism now. I just wish they would be more open with their reasoning. I doubt many on here being told that the FIA is trying to avoid further changes to F1 by adopting the halo now would object as strongly. What quotes are you talking about? Doesn't that rather suggest that - contrary to the tinfoil hat brigade here claiming that the FIA are covering up the truth - in fact the FIA have done a very good job of investigation and not allowed any 'propaganda' to cloud their findings? And the people saying the halo couldn’t have taken much more didn’t actually read the report properly or didn’t grasp it. The report said, had the whole car impacted the halo at that speed without the failure point (something breaking) then the halo would have failed. The halo is probably the strongest component of a formula 1 car outside the engine. Any other part of the car impacting it will fail and remove energy from the system. That’s the point. The others saying “a wheel at 330 kph would destroy the halo what’s the point”. The point is if the wheel hit a car without the halo it would destroy the drivers head - the halo deforming and maybe hitting the driver is objectively better than a tyre hitting a driver at 330 kph. If it would have missed the driver but still hit the car at that speed then the car would still be absolutely destroyed. The halo failing in large accidents isn’t a bad thing... That’s how crash structures work. They are strong to a point and then they fail, that failure is less damaging than the accident without it. As for the crash at the last race, yep that was scary briefly but he wasn’t ever in any danger. Drivers shouldn’t be removing themselves from an upside down car unless they are in serious danger - they could seriously hurt themselves. The question is could he have fitted between the halo and the ground, and the answer is we simply cannot say. The FIA designed the halo to make F1 cars objectively safer. Unless you subscribe to some conspiracy where it was to avoid being sued for Jules’ death and they are trying to bbq drivers... Then you have to accept they believe it to be safer in almost all circumstances, they’ve tested self extracation from the cars upside down and said it was possible. Like others have said, we’ve seen drivers trapped before even before the halo. A driver being trapped in a halo car doesn’t mean they wouldn’t have been trapped without it. Leclerc is another issue, the wheel would have just missed him. But the wing would have hit the visor (most likely). I’m glad he wouldn’t have died if the halo had been postponed but it was so close it does demonstrate the use of the halo. Is the halo a nice looking solution? No. Is it probably the best we’re getting for awhile. Yes. Should we try to make it better? Yes. Should we as fans support those efforts? Yes! Are teams still allowed to put aero bits on the Halo? If I'm not wrong all new cars was revealed with "standard" Halos... unless they're simply waiting for winter testing.